The Royal Monastery of our Lady of Guadalupe is located in the beautiful town of La Puebla, which has become one of the most important centers of art and culture in the Extremadura region. The monastery date back to the 13th century when the cowhand Gil Cordero found a Romanesque statue of the Virgin. A hermitage was built on the site and the image was placed in it. The image was named Guadalupe, which means hidden river. The building has an irregular shape because of the various additions and construction over the centuries. It has the appearance of a fortress with battlement towers and walls. 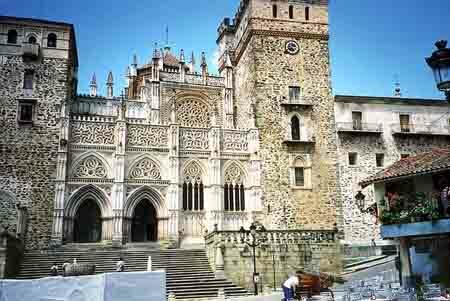 The monastery’s church was built in gothic style during the 15th century and holds within its walls many valuable works of art, paintings by Zurbarán and El Greco, books, embroideries, and jewelry.